Have just a week? On this Intro to Portugal itinerary, you can arrive in Portugal on a Saturday and leave a week later on Sunday, get a good feel for the country while experiencing 3 of the regions, see some of the best of the country, and do so without rushing around. This itinerary will minimize your driving – the longest distance is 1.5 hours – so that you have more time to explore and experience. You will leave feeling like you have really seen a lot, yet also leave refreshed and inspired! 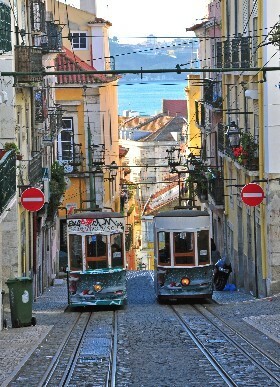 On your arrival in Lisbon, we will welcome you at the airport and transfer you to your first hotel. Depending upon your arrival time, a guided afternoon walking and tram tour will give you an orientation, and good feel for the historic center of the city and its neighborhoods. Visit Belém with our guide in the morning – the part of Lisbon along the Tagus River dedicated to the explorers and explorations. In the afternoon, continue to self-explore this part of the city, take in a museum, or return to the center for a bit more exploring. And of course you cannot miss an evening of dinner with Fado, Portugal’s World Heritage Music! Today you will collect the rental car and leave the capitol, driving just 1.5 hours to the World Heritage town of Évora. 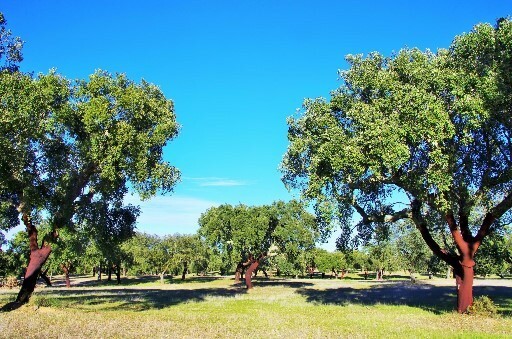 Évora lies in the countryside, in one of the primary wine regions of the country, the Alentejo. This region is home to fields of cork trees, olive groves, sheep and cattle, vines and vineyards. It is a culturally and historically rich area, and it is known for some of the best food and wine in Portugal. This afternoon, walk to explore the town, with a stop for a break overlooking a Roman temple! After a leisurely morning in Évora, drive to visit a local winery for a tour and tasting, explore the wine route, visit some pottery making villages, or take in some megaliths. You will not want to miss the tiny hilltop village of Monsaraz. Originally fortified by the Knights Templar, this fairytale village still maintains its medieval atmosphere, yet is home to some 100-150 residents. Visit some of the ‘Marble Towns’ of Portugal – the marble rivals that of Carrera, Italy. In Vila Viçosa, nearly everything you see – the palace, door and window frames, churches, benches, sidewalks, and even the toilets in the bus station are made of the "white gold," that comes from the nearby quarries. Estremoz is the largest of the ‘Marble Towns’, crowned by a castle, where you can enjoy a wonderful view of the town and the plains surrounding. At the end of the day, drive 1.5 hours to the coast outside of Lisbon for your last stop, where you can enjoy a wonderful dinner of fresh fish beside the sea. Explore this charming town, formerly a quaint fishing village, that became (along with Estoril) a popular resort and then refuge favored by the European nobility and kings in the 20th century. Today it is a colorful cosmopolitan town with cobbled streets, luxurious villas, cute shops and restaurants. Take a walk along the boardwalk to Estoril where you will find Europe’s largest casino – the inspiration for Ian Flemings “Casino Royal”, spend some time at one of the lovely little beaches, explore the town park with its colorful peacocks and roosters, or make a stop in the Lighthouse Museum and Museum of the Sea. From Cascais, you will not want to miss a visit to Sintra. This fairy tale village is home to castles, palaces, gardens, fantastic manor houses, and a charming village center. From the Romans who named it "Cynthia" after the goddess of the moon, to the Moors who appreciated its lush microclimate and built a hilltop castle, a palace, and fountains, to the Portuguese royals who made it their summer residence, this charming town has attracted people for centuries. Lord Byron, in the 18th century, wrote that the town is "perhaps in every respect the most delightful in Europe,". 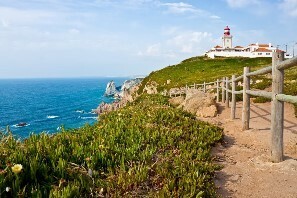 For your last day, drive along the coast to the most Western point in Continental Europe, Cabo da Roca. Stop to visit some of the small villages along the way, walk on a beach surrounded by fabulous rock formations (there are dinosaur tracks in the area!). Stop on the return at a wonderful windmill bar, for a drink at sunset with a wonderful view over the beaches and town below. Return the rental car at the airport on your departure.